Our brains don’t need to tell our lungs to breathe or our hearts to pump blood. Unfortunately, computers require instructions for everything they do. But what if machines could analyze big data and determine what to do, based on the content of the data, without specific instructions? 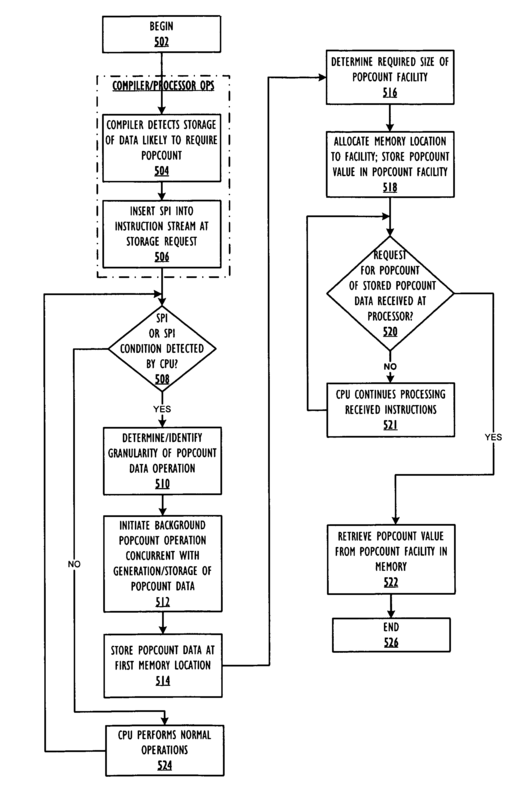 Patent #8,387,065 establishes a way for computer systems to analyze data in a whole new way, using “speculative” population count (popcount) operations. Popcount technology has been around for several years. It uses algorithms to pair down the number of traditional instructions a system has to run through to solve a problem. For example, if a problem takes 10,000 instructions to be solved using standard computing, popcount techniques can reduce the number of instructions by more than half. This is how IBM Watson played Jeopardy! It did not need to be given instructions to look for every possible bit of data to answer a question. Its Power 7-based system used popcount operations to make assumptions about the domain of data in question, to come up with a real time answer. One is that while big data is, well, big, the output of popcount is small. Thus, speculating ahead of time on big data dramatically improves performance when the real time request occurs. Another is that even when the region of data to be analyzed is uncertain, the popcount can still generate a correct answer because of its cumulative nature. Basically, the speculative results accelerate obtaining the right answer. Imagine Watson being able to speculate on what it’s being asked so that it combs through a domain of data in real time. And before the person who is asking the question even finishes speaking, the computer has already found the right answer. Speculative popcount technology is poised to be a foundational piece of this new era of cognitive systems because of how it efficiently analyzes any kind of data, across any domain. These systems will be able to cut through the big data to find the right data. IBM has led in total U.S. patents for 21 year in a row in 2013. Read more about patents like #8,387,065, here.